Maybe you need to do simple maintenance. Maybe you want to tackle a small home project, like hanging a series of shelves. Whatever it is, you’ll probably need some tools. Here are the tools you’ll need to complete common projects and simple maintenance tasks at your apartment. Need to take something apart? Remove it from the wall? You’ll probably need a screwdriver or hammer. Whether electronic or manual, screwdrivers are a basic requirement for almost any project. Screws are used to hold most things together. Hammers are good for the same reasons: nails are everywhere. For those shelves you’ll be hanging, you’ll probably also need a drill. To hang on drywall you’ll need anchors. But if you’ll be hanging directly on wood, you’ll need a drill so the wood doesn’t split when you put screws in it. Vise grips are your all-in-one tool. They lock, so they can be used for clamps. They extend, so they can be used like wrenches. They also grip, so they can be used like pliers. Get a pair of vice grips, and you’re probably set for most projects or issues that’ll arise. 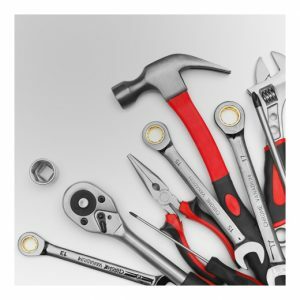 We’ve covered tools you’ll need to put things together, hang things up, or take things apart. One last thing you’ll need: a tool to cut things. That’s where a utility knife comes in. Most utility knives will enable you to cleanly cut anything from cardboard to carpet, from plastic to drywall. Whenever you cut, you’ll probably need to glue. So keep some glue handy. You don’t really need many tools when you live in an apartment. That’s because a perk of apartment living is having access to a maintenance team. They’ll take care of all major maintenance issues you might come across. But it’s good to have tools for simple maintenance and projects. The post Essential Tools for Apartment Residents appeared first on Apartments For Us.